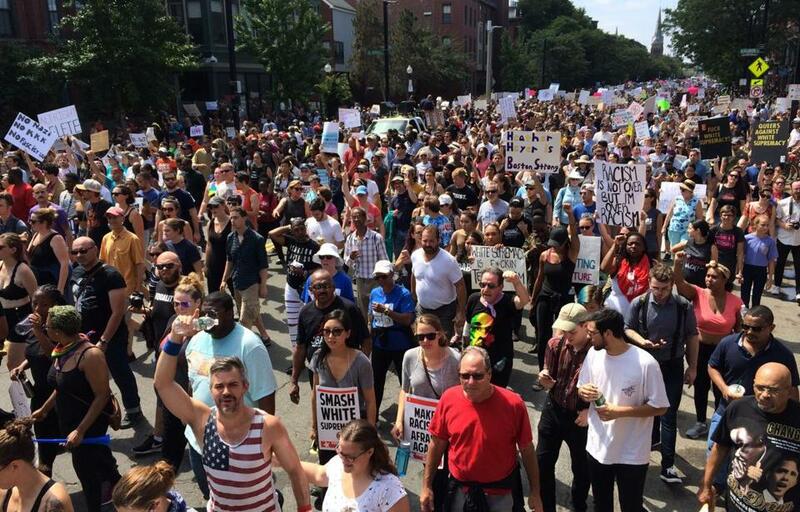 Counterprotesters marched toward Boston Common. 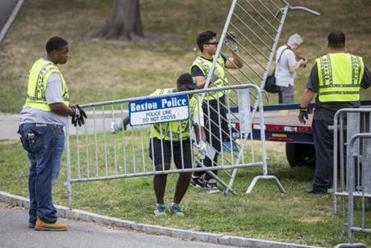 The Boston Free speech rally broke up shortly after it began on Saturday, with police escorting supporters out of the bandstand in the Boston Common. The Boston Free Speech rally organizers had 14 speakers scheduled to address crowds gathered on the Common and planned on opening with a reading of the Bill of Rights and a moment of silence for Heather Heyer, who was killed in Charlottesville, Va. last weekend, according to a Facebook post. It was unclear how many speakers got a chance to take the microphone before the rally was ended. According to a Periscope feed, Deaconess Anne Armstrong of The Healing Church led an the opening ceremony as scheduled, but it was unclear if the the tribute to Heyer, the 32-year-old counterprotester killed in the rally last Saturday in Charlottesville, was included. Armstrong is the leader of the small Rhode Island cannabis church, which advocates the use of the marijuana in religious rituals and a former write-in R.I. gubernatorial candidate. All of the Globe’s coverage of the “free speech” rally on Boston Common and counterprotests around the city. The speakers who were scheduled to start shortly after noon were: Dan Hill, Michael Lindskog, Garret Kirkland, Daniel Alejandro Medina, Benjamin/Citizen D’Amour, Donnie Palmer, Rinaldo Del Gallo, and Tammy Lee. The rally’s headliners who were scheduled to get started around 1:40 p.m. included Liberterian US Congress candidate Samson Racioppi, Republican US Senate candidate Shiva Ayyadurai, right-wing extremist and staunch Trump supporter Kyle Chapman, and conspiracy theorist Joe Biggs, known for his work with Infowars. Rally organizers had also listed a “surprise guest” -- listed as a “living meme” -- for 2:10 p.m.
Chapman was charged Wednesday by the Alameda County district county attorney in California with a felony count of possessing a lead pipe, the Associated Press reported. The charge stems from Chapman’s arrest in March after a fight in Berkley, Calif. between Trump supporters and counterprotesters. Clarification: Over the weekend, Bostonglobe.com published the names of people listed on the “Free Speech” rally organizers’ Facebook page as speakers for the Saturday event. Among those listed was Rod Webber. He did not speak, and maintains that his name was listed in error. Aimee Ortiz can be reached at aimee.ortiz@globe.com. Follow her on twitter @aimee_ortiz.